Being Julia	No ratings yet. Would someone please give this girl an Oscar?! 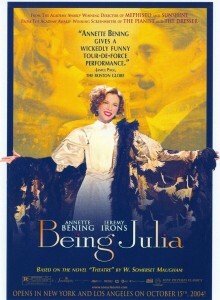 Annette Bening is nominated this year for her performance as the title character in Being Julia – a stage actress who certainly knows how to emote! Fun, sophisticated and clever, great dialogue – this is a very adult movie with a huge payoff ending that makes the whole set up just priceless. Tagline: Passion. Obsession. Revenge. Prepare for the performance of a lifetime.